I flowed color freely onto a wet sheet of watercolor paper, using lots of dense pigment. My original intention for this sheet was to paint a scene of Monument Valley I had photographed. 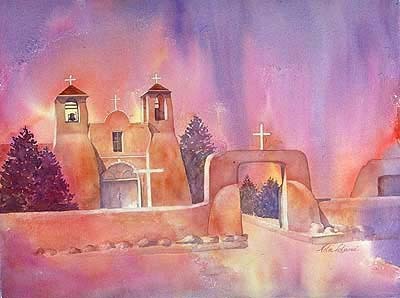 Instead I found my photograph of the Ranchos de Taos church of St. Francis in New Mexico. I realized that the accidental light areas on my paper suited this subject perfectly, so I changed my subject and painted the church as a shimmering presence. The image is also available as a print. The painting is featured on p. 84 of Exploring Color.